Businesses nowadays turn to technology to better serve their customers, to reduce operational expenses, and to get an edge on their competitors. 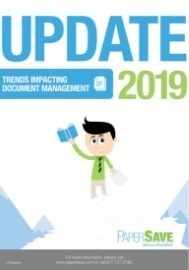 But since technology is ever-changing and business leaders can barely keep up, we decided to share this FREE eBook entitled “Trends Impacting Document Management: Update 2019”. It outlines the most recent developments that you should implement to improve service quality and business efficiency. Fill in the form below to receive a complimentary copy. Case Studies: See What Our Clients Have to Say!